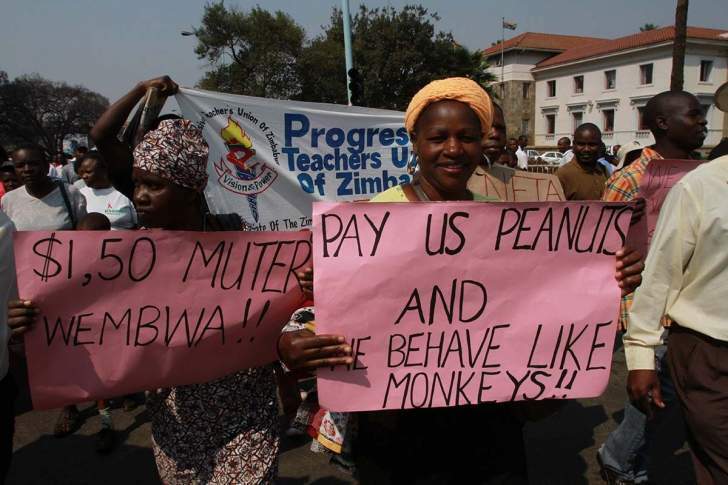 Government and civil servants yesterday sealed a salary accord after the employer improved its offer to the workers from $350 million to $400 million. This will translate to a salary increment of $129 across board effective April 1. The lowest paid worker in Grade B1 will now be getting $570 up from $441. Negotiations for a further salary review—possibly in June—will continue with other non-monetary incentives being considered. The Government workers put pen to paper after a Joint Negotiating Council (JNC) meeting held in Harare. "Government undertook to clear the Premier Service Medical Aid Society (PSMAS) arrears resources permitting and provide additional public service buses to augment the current fleet of buses." The JNC also agreed that Statutory Instrument 52 of 2019—which allows civil servants to import cars duty-free—be implemented. It was also agreed that study tours on the establishment of the Public Service Bargaining Council be conducted by June 2019. Apex Council chairperson Mrs Cecelia Alexander said negotiations will continue until the welfare of civil servants improved. "Though we have our demands which we want met, at least this is a sign of fruitful dialogue which has culminated into this agreement," she said. She added: "As Apex Council we are also happy that finally we have been heard on the issue of duty-free cars. This is also a sign that Government is committed to the betterment of our lives as workers and we hope all other non-monetary incentives we are pushing for will come to fruition." Government recently unveiled a $60 million housing facility for civil servants as part of the non-monetary incentives. A memorandum of agreement between the employer and the National Building Society (NBS) on the rollout of the project is in place.